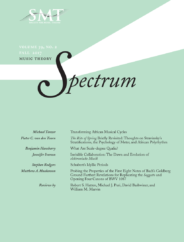 A leading journal in the field and an official publication of the Society for Music Theory, Music Theory Spectrum features articles on a wide range of topics in music theory and analysis, including aesthetics, critical theory and hermeneutics, history of theory, post-tonal theory, Schenkerian analysis, musical form, rhythm, music cognition, and the analysis of popular musics. The journal welcomes interdisciplinary articles revealing intersections with topics in other fields such as ethnomusicology, mathematics, musicology, philosophy, psychology, and performance. The most recent publication by leading theorists Michael Tenzer and Pieter van den Toorn brings to the fore issues relating to the analysis of African music. Well known for work on Balinese music and for championing the new movement towards analysis of world music, Tenzer here indulges a long-standing interest in African music by exploring deep parallels between two compositions: a beautifully elusive flute-and-voice piece recorded in 1966 by Simha Arom and Genevieve Taurelle and given the title Hindehu; and Nhemamusasa, a standard item from the Shona mbira repertoire recorded by Paul Berliner in 1977. Mustering an array of analytical techniques, Tenzer argues that the two pieces are versions of each other. To demonstrate that transformation, he devises 14 nodes or pathways through Hindehu while performing a series of operations on individual segments in order to arrive eventually at the target piece, Nhemamusasa. This is speculative music theory at its most intriguing. Support for historical, generic or stylistic links between the two compositions is tenuous, but the author follows through with his initial hunch that they share a deep-level affinity. Tenzer does not provide counter examples of cyclic compositions that fail to transform into one another. Is it possible that the operations he deploys (transposition, retrogadation, octave transference, deletion, and others) are so general and in such widespread use that they undermine the specificity of this particular Hindehu-into-Nhemamusasa derivation? And yet it is precisely the force of abstraction and composerly invention, so long under-utilised by anthropologically-oriented ethnomusicologists, that Tenzer’s essay, written in full methodological awareness, celebrates. It’s a mark of a successful article that one can still find plenty to engage with—indeed to be inspired by—even if one is less persuaded by the ethnographic specifics upon which it is based. Pieter van den Toorn, too, engages African music, but with a different goal. An authority on the music of Stravinsky, van den Toorn seeks an answer to the ultimate source of the effects in the Rite of Spring: “What accounts for the vitality of the Rite, the ability of this music to excite?” That search leads him through varieties of pitch combination, many of which sport a residual tension (or duality, or incompatibility), to rhythmic repetition, and to West African drumming. Did Stravinsky know African music? The answer appears to be ‘no’. We’re therefore not dealing here with questions of influence. Does some of Stravinsky’s music sound African? The answer to that question appears to be ‘yes.’ Showing that something sounds African is, however, not always straightforward, whereas showing that something is organized in ways analogous to West African ways of organizing polyrhythmic ensemble music is very doable. The specific Stravinskian device of interest to van den Toorn is stratification or superimposition. The Rite, indeed, may be said to be defined by it. Interrogating stratification means attending to the relative autonomy of individual strata, to the propulsive forces of rhythmic repetition, and to the relative stasis in the harmonic field as chords are suspended or juxtaposed without the syntactical obligations of Germanic functional harmony. It is precisely in connection with such stratification that the author’s analogies with Gahu and other ensemble musics from West and Central Africa are most persuasive. Yes, there are differences on many levels: Gahu exists in an oral tradition, is played by an ensemble of bells, rattles and drums, is danced to by dancers who double as singers, has no ‘harmony’ in the Western sense, and thrives on pre-arranged signaling between lead drummer and dancers. But the ultimate compositional challenge of producing a polyrhythmic texture in which strata featuring unvaried repetition are aligned in unpredictable ways invites analytical scrutiny of the sources of dynamism in the two musics. Contextualists who might be waiting for historical evidence that will legitimize these acts of comparison may have to wait for a very long time. In the meantime, Tenzer and van den Toorn have accomplished something in the vein of Edward Said’s contrapuntal reading–reading across repertories or compositions while ignoring conventional constraints of history, genre or style. The fact that music lives on in performance, that its tense is very much a present tense, gives the lie to musicology’s and ethnomusicology’s insistence on background information, performer testimonies, and the like. If the actual notes and patterns produced by musicians, both African and non-African, are to be properly understood, they need at some stage to be isolated and inspected at close quarters. Direct engagement, not mediated engagement, is music’s truest demand. The drastic mode triumphs over the gnostic. The acts of border-crossing represented in these two articles are positive transgressions likely to enrich both the discourse of music theory and the intellectual capital of African music. Thanks to van den Toorn, we can compare the rhythmic procedures of no less a figure than Beethoven with those stemming from a more ancient West African tradition. This possibility can be heard in a scherzo from the string quartet in B-flat, op. 18 no. 6. And thanks to Tenzer, whose essay owes much to a composer’s curiosity, we can explore other encounters with African music, be they appropriations of Ashanti music by Roy Travis, use of Yoruba and Ewe time lines by Steve Reich, or the striking parallels between Ligeti’s polyphonic thinking and that displayed in Banda-Linda horn orchestras. The potentials for dialogue and insight are immense and exciting. Image credit: By Maxime Niyomwungeri. Public domain via Unsplash.